Making apple juice is a family Fall tradition at the Klassens. We made it for the first time with Harv's parents over 40 years ago with a borrowed press on a dark and stormy night. The following year Dad Klassen built his own press and we have been refining and streamlining the process ever since. 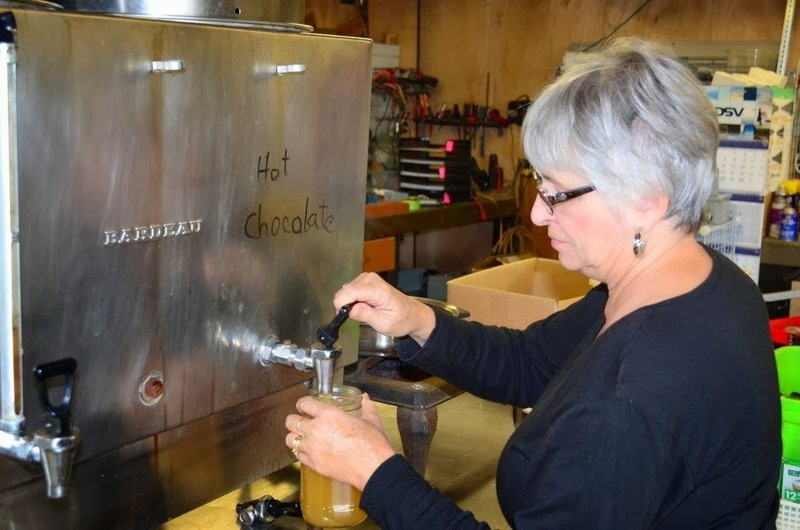 This year it worked like a well oiled machine with only one small adjustment to make the juice heat up faster. We start with a trip to get apples. We get them in Keremeos from an apple farmer with whom we have have a long standing arrangement. He has a commercial press and knows the best apples to use. This year Cox Orange and Golden Delicious were his apples of choice. He loaded our pick up truck with apples - 1800 pounds of them! The children are all eager to help - What fun it is to toss those apples into the washing bucket. Ella sorted the apples so we got a good mix into the juicer. But it's not all work to the grandkids. It's cousin time too. where he dumps them on to a chute. Rick guides them into a hopper where a drum studded with screwheads and powered by an electric motor spins around and chops the apples into tiny pieces. We learned early on to cover that spinning drum! When the vat is filled to the brim, it gets moved forward under the press. Another vat is placed under the chopper so we can keep chopping while the full one is pressed. The pressed juice flows into the stainless steel tray and is funneled into a waiting bucket. Tim punches out the remaining apple pulp. Ben gets the first taste of the fresh juice. We ration it out though because one cupful can be as filling as eating several apples. We then strain out any bits of apple form the juice before it gets suctioned up through a heat exchanger into an old beverage dispenser Harv found at a used building supply place. Then it's my job to dispense it into jars and seal each jar with a hot lid. In years past it was an all day job, with cleanup sometimes lasting until 11 pm but each year our time is reduced by Harv's innovations and this year we started at 9 and had everything cleaned up by 5:30. It's hard work but it's fun work with the family all pitching in. Here are a few more glimpses of the day. Julia and Dean enjoying their "boxed snack"
Nate bites into one of the treats that Nana provided to make the day even sweeter. Jen and Dulci supervised the outside work and the smiles tell you that it wasn't a tedious process. Time out for a simple lunch - hot dogs and platz. Adele looked after providing us all with snacks and meals while watching the little ones. This was Dean's first apple juice experience! My mouth is watering just at the mention of Cox-Pippin. Although we're just one province over we never see those here. I can't imagine all the Cox-Pippins I'd like, let alone a full glass of Cox-Pippin juice. What bliss. Absolutely amazing and mind-boggling! I am so envious! Thank you for sharing this amazing experience with all of us. The children will always remember this experience. It's all about building family memories. What a great great family tradition. Do you know if this is the same as what we call cider, or apple juice since it is technically pastuerized?? Just wondering. We call it juice but our American kids call it cider. 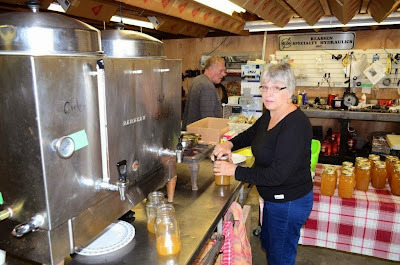 In Canada the term Apple Cider usually refers to the alcoholic cider. That is soo neat, Bev! What a wonderful tradition that the kids can grow up with and hopefully pass on generation to generation ! What a fun family day with a great reward. Hard work and precious memories! That apple juice must be so delicious! What fun you all had as you accomplished all this! And a sunny day to top it off. Great pictures, Bev. Looks like fun AND work!! So, do you not need to water bath or pressure can the jars? No - the jars seal right up and stay sealed. Fascinating! What happens to the leftover apple pulp? What a wonderful experience, thank you for sharing the day. I too was wondering what happens to the apple pulp that is left. Perhaps it goes into a compost pile or is used for animal feed? When we did it at my Father in laws, the dry pulp was taken next door to feed the neighbour's pigs. Now we just compost it. I think the prettiest picture of the bunch is where the jars are all lined up. We were pretty proud of ourselves doing up 50 quarts of grape juice, lol. Amazing guys! So neat. Oh, my goodness!! What fun you have all together making delicious juice! We have made it with a steam juicer but it doesn't taste anything like the pressed juice. Thanks for sharing this great activity.